Chapati is an Indian flatbread that can be used to scoop up vegetable or meat curries, or dhal. This was the first time I made chapati, but it's more or less the same process as corn tortillas. The main difference is that you knead (hehe) to let the dough rest for an hour because it gets tough to work with, whereas tortilla dough is more like playdough. I used the same technique to roll the flatbread out as for tortillas. 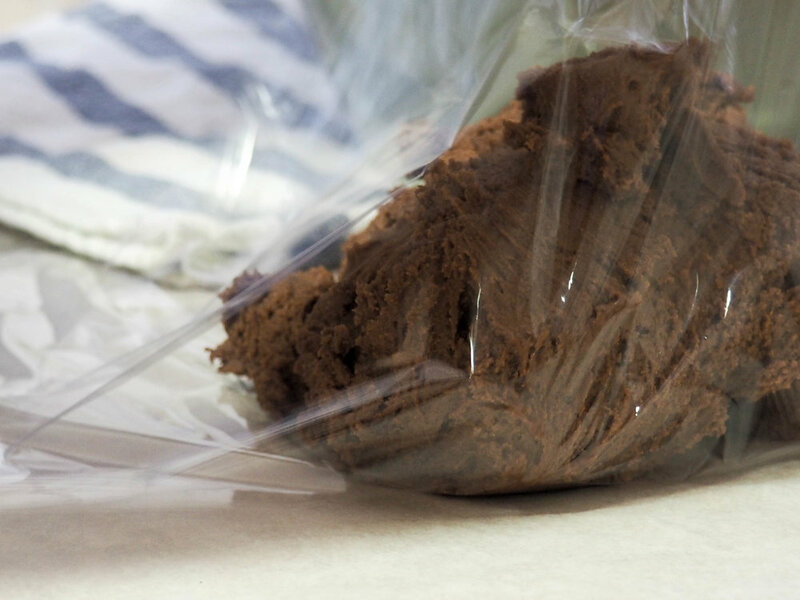 I cut the sides of a zip lock bag open and rolled out a small piece of dough into a 10cm circle between the plastic. I made about 16 small chapatis, but you could make larger ones. Cook in a piping hot cast-iron pan, and watch carefully not to over burn. You can see mine have black spots, but you don’t want to go overboard! 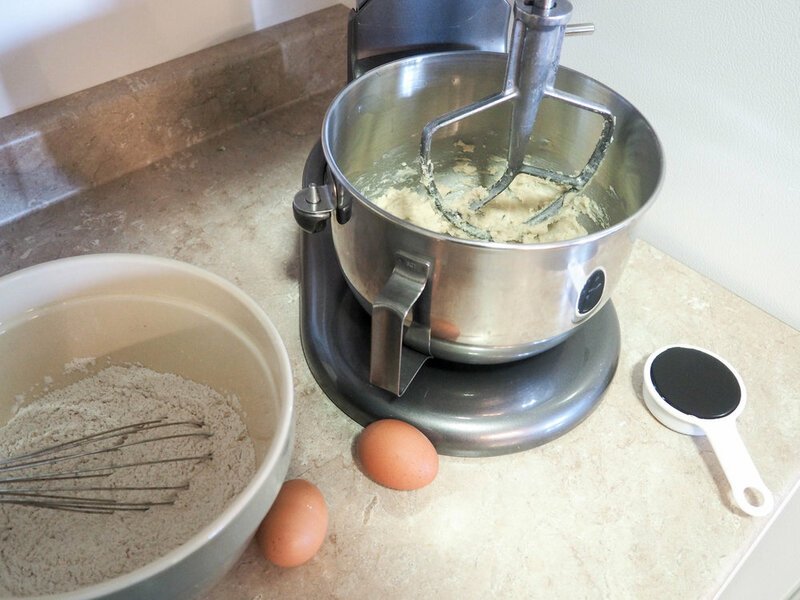 Mix flour and water together in bowl to make stiff dough. Stir in soft butter and knead dough on lightly floured surface for about ten minutes. Roll dough into ball, cover with damp cloth and let rest for 1 hour (dough can also be wrapped and refrigerated overnight). Knead dough at room temperature for 3 to 5 minutes. Break off pieces the size of a golf ball. Flatten each ball with your hands; using a rolling pin, roll each between plastic or waxed paper into 20 cm rounds. Heat ungreased cast-iron skillet until very hot. Cook one chapatti at a time. Put chapatti on skillet for about 1 minute until brown spots appear underneath; turn over and cook on the other side for 1 minute. Wrap chapatis in clean tea towel to keep warm. Tourtière is a New Year's Eve tradition, but is also yummy in the Spring with a leafy salad on the side. Whatever the occasion, it is easy to prepare ahead and stick in the oven so it's ready when guests arrive. I adapted this recipe by adding some more spices (the original recipe just has sage, salt, and pepper, so if that's all you have, use that!). I felt creative so I made a lattice top. Here are the instructions, but the pastry browns so beautifully in the oven, it's impressive with simple pinched edges. Enjoy! 1. Roll your bottom dough out into a circle and place in the pie plate. Stick it in the refrigerator to keep it cool. 2. Roll out another dough and cut 8 one-inch strips and 4 two-inch strips. Put these on a parchment lined sheet and stick in the freezer for 10 minutes. I found cooling them makes them easier to handle. 3. Remove your prepared pie plate and add your filling. Lay strips in the this order: small, large, small, small, large, small. Lay the remaining strips in the same order on your baking sheet. See picture below. 4. Flip back the two large pieces and slide a one-inch piece perpendicular to your strips. This one-inch piece will be laying over top of the other one-inch pieces. 5. Flip the two large strips back down flat. You've completed your first weave! 6. Flip the small pieces back and slide a large (2-inch) piece perpendicular to your strips. This two-inch piece will be laying over the other 2-inch pieces. See picture! 8. Continue this pattern until you use all of your pieces. 9. Trim the edges and press bottom pastry layer to the lattice layer using a fork. 10. If you've made it this far, why not add a braided crust?! Brush a beaten egg yolk over the crimped edges you created with a fork (the egg acts like glue). Fix your braids to it. Brush the whole top with the remaining egg-yolk. Ta da! Brown meat, onion, and spices in large skillet or Dutch oven over medium heat until brown but not dry. Line three pie plates with pastry, and fill with meat mixture; top with pastry, slash so steam can escape. Bake at 350°F for 45 to 60 minutes until crust is golden brown. Let cool and freeze extra pies for up to 3 months. This recipe makes me happy because it reminds me of how my mum would cook – she would always make a ton and freeze the extras. When I make pie pastry, I usually used my food processor, but I did this one by hand which is always fun. 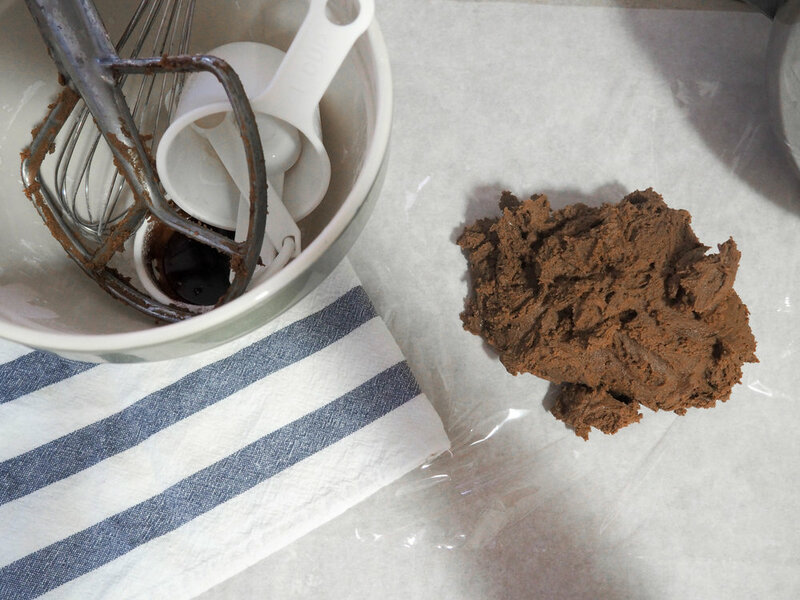 If the dough isn’t forming a ball, add cold water one tablespoon at a time until you are happy with the texture. I also flatten the dough into a disk and tightly wrap in plastic wrap when refrigerating. I find this helps me form a more circular shape when I roll the dough out. This pie dough is great for savoury pies (notice there is no sugar in it! ), but I also think it would be really nice with some extra sweet summer fruit. If you want details on how to make a lattice top, I wrote out instructions in the Tourtière post! Combine flour, salt, baking soda, (in the biggest bowl you have!) and stir with a whisk. Cut in lard, using a pastry cutter, until the mixture is the size of small peas. Add enough cold water to vinegar to make 1 cup; stir in egg. Add to flour mixture, stirring with fork until mixture forms ball. Roll into 3 balls; wrap tightly in plastic wrap. Chill in refrigerator before rolling out onto floured surface. Makes enough for three double-crust pies. Near the end of March, daytime temperatures start to make it above zero while the nights remain chilly. This weather marks sugar season! Maple syrup is the first harvest of the new season. In the day, the sap starts to flow, and it takes about 10 buckets to make 1 bucket of syrup. The first sap from the trees is lightest in colour - golden syrup. This is my favourite! As a child, I preferred golden corn syrup on my pancakes (!) to maple syrup. Thankfully my taste buds have matured (or I've grown more Canadian), but I still love golden maple syrup the best! I drove to the county, which is about an hour from Kingston for the afternoon. I stopped at Roblin's and got the tour, from sap to syrup. 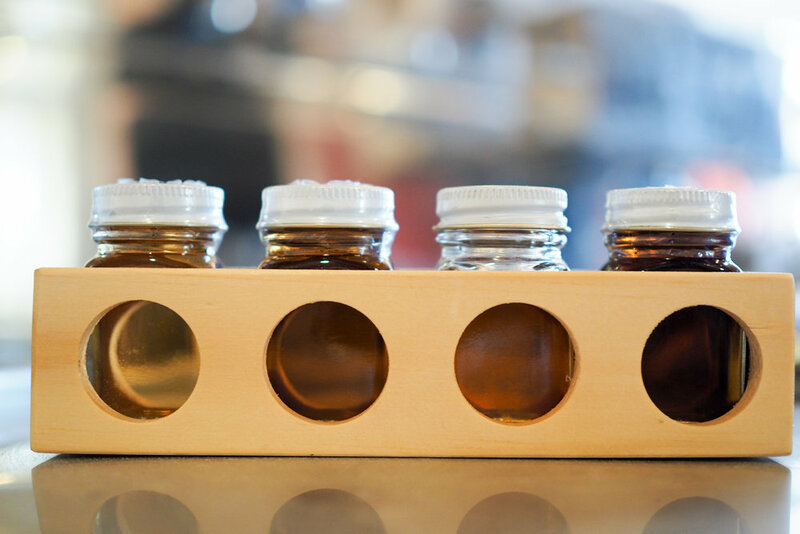 I like the picture showing the colour gradient of the syrups. As a maple syrup farmer, you can't choose to make a rich, dark syrup, it's just whatever the tree decides to give you. I thought that was so neat! After the tour I had some "maple shooters" and bought my favourite flavours to take home. Tasting wine is now my second favourite kind of tasting! On the way home, I stopped and took pictures of trees that had been tapped. Then I drove past some highland cows and I had to pull over! A successful afternoon in Prince Edward County! Beat eggs yolks in a bowl set over a pot of simmering water until light. Beat in maple syrup until well blended. Stir constantly, until mixture thickens, about 12 minutes. Remove from heat, stir in vanilla, and pour through a sieve. Place plastic wrap directly on the surface of the mixture, preventing a skin from forming; chill in refrigerator. When syrup has thoroughly cooled, whip cream and fold in. Beat eggs whites until stiff, and fold them in. Pour into glasses and freeze until firm, about 3 hours. Before serving, let stand at room temperature for a few minutes. I would like to dedicate this post to my brother Jordan. I'll explain. When we were young, we ate potatoes all the time, yes, yes, yes everyone knows that. But, we also ate meatloaf on the reg. Not a favourite meal by me or my little brother. I remember waitressing at a place that had meatloaf on the menu and thinking... who would ever choose to order this? I'm way less picky now, as I got into my teens I didn't mind having meatloaf. But my brother Jordan, used to dissect the onions out of each slice. He would end up with a hollowed out piece of meat, with a pile of tiny onions on the side. I don't even know how he did it! We kept telling him, you can't even taste them! But he did it anyways. I even saw him do this about three years ago. So, for this recipe, I chose to blend the onions and the celery into teeny tiny pieces, so small they'd be impossible to remove from the loaf. Ha! That's what sisters are for right!? In a food processor, blend onion, celery, garlic (optional), ketchup, and mustard. In a large mixing bowl, combine ground beef, crumbs, milk, egg, and food processor mixture. Mix well with a fork, breaking meat into small pieces. Add salt and pepper. Pack into 8 ½ x 4 ½ inch loaf pan; smooth top. Alternatively, shape mixture into a mount on a baking tray lined with parchment if you like the browned crusty surface of meatloaf. Bake in 350°F oven for 45 to 50 minutes or until meat is no longer pink. Allow to set for 10 minutes before serving. To store: wrap any leftover meatloaf in plastic wrap. Refrigerate for up to 3 days; freeze for up to 6 weeks. Scalloped potatoes! When I look at pictures of them, they just remind me of a summer barbecue! I know I have already mentioned how much my family ate potatoes growing up - all the time. So much that I wrote my Grade 8 speech about potatoes - and all the ways that you can eat them. I think it was pretty hilarious, at the time and thinking back on it too! Speeches were NOT something I enjoyed, at all. I remember getting my first "B" in Grade 4 on my speech about my family vacation (camping in Algonquin Park). It was gut wrenching for me! The following year I did a demonstration on how to make chocolate chip cookies, which I loved because I felt like I had my own cooking show. Grade 6 was all about highland dancing, and I wore my Kilt to school. Grade 7 took a turn with the ozone layer, and I went even more downhill in Grade 8 with the topic of "potatoes". I think I sort of gave up to be honest!! "Potatoes" as the topic was my mum's idea. She probably mentioned it half seriously but I jumped on it! The first minute was an act of memorization - I listed 100 potato dishes, sort of like the shrimp scene on Forrest Gump. I figured this was a great way to eat up a portion of the 3 minute minimum presentation (which felt like eternity when I was 14!). I don't think anyone could have predicted that I would still be talking about the ways to eat potatoes 15 years later! Slice potatoes thinly and layer with onions, salting and peppering each layer, in a shallow 8 inch (2 L) casserole. Melt butter in saucepan over medium heat. Stir in flour and cook for 2 minutes, stirring constantly. Stir in milk and heat, stirring just until tiny bubbles from around sides of pan. Remove from heat and add cheese. Stir until melted and smooth. Pour sauce over potatoes and bake for 1 hour at 400°F. Sauce will thicken as it bakes.